I've used every kitefishing system possible to date and although I've never caught more fish per set than with the Bottom Longline, or had faster setting speeds than with the two kite Dropper Rig, I have found the most enjoyable and easiest to run system is my Pocket Sled Kite rig on a Penn Seaboy reel on a short stout boat rod. My seaboy is spooled with 300 metres of 10kg dacron and I use a Pocket Sled Kite to tow out 2 to 4 hooks per set depending on the wind strength on the day. In order to retain the full 300 metres of line on the Penn Seaboy for casting distance offshore I have a 10 inch handcaster spool which holds the Kiteline, Dropper Cord, Dropper Line, Bottle Cord, Leader Line and my four hook pre-stoppered hook section. As the Pocket Sled has no rods or spars assembly couldn't be any easier. 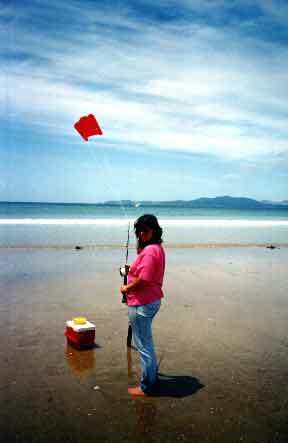 I simply unroll the kite, clip the drogue onto the back of it and it's ready to fly. I then clip the kite bridle to the end of the kiteline on the handspool and launch it. As the kite gains altitude it pulls the 50 metre kiteline from the handspool. Between the kiteline and dropper line is a 3-way cord. The spare eye of the cord is where I clip my rod line (mainline) to. Then with the reel set to a light drag the Pocket Sled pulls line from both the fishing reel and the handspool. Once the 30 metres of dropper line is airborne another 3-way cord (between the dropper line and leader line) provides a loop for attaching the bottle float. Being such a light weight rig and such a small kite, a half litre soft drink bottle is plenty big enough to for keeping this rig on the bottom. Sand or water is put into the bottle, the amount depends on how much pull is being provided by the kite on the day. Correct weighting of the float bottle is critical, the kite should be able to pull the bottle easily, but not be able to lift it out of the water. I have a short dacron cord and snap clip already connected to my bottle so I just clip it to the loop in the three way bottle cord. When the bottle is connected to the line the kite stops gaining altitude and starts to pull the line offshore. A 15 metre leader line is then pulled from the handspool followed by the 4 hook section. With the hook section in hand I lock the drag on the seaboy, bait my 4 traces and clip a small one or half oz weight at each end of the hook section onto the crossline swivels and it's ready to go. Generally this entire exercise to this stage takes only about 5 minutes. That's another thing I really like about this particular system, the setting up time is absolutely minimal. All that is left to do now is release the drag on the seaboy and thumb the reel as the mainline heads offshore. Thumbing the reel for the first 100 metres or so keeps the mainline clear of the water and prevents the mainline from sagging and possibly tangling up with the dropper or hook section. I usually only leave the gear set for around 10 minutes. 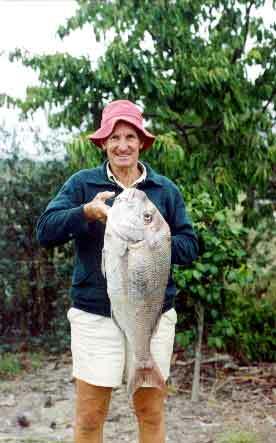 The last time I went fishing I did two sets of 2 hooks and wound up with 4 snapper, (the smallest of them was bigger than Paul's biggest snapper taken from 1000 metres out on his Penn 9/0 rig).